(MENAFN - Gulf Times) The World Innovation Summit for Health (WISH), an initiative of Qatar Foundation (QF), has announced the activities for Doha Healthcare Week, starting from tomorrow. The inaugural seven-day festival will feature a host of workshops, health checks, and mental and physical wellbeing activities. 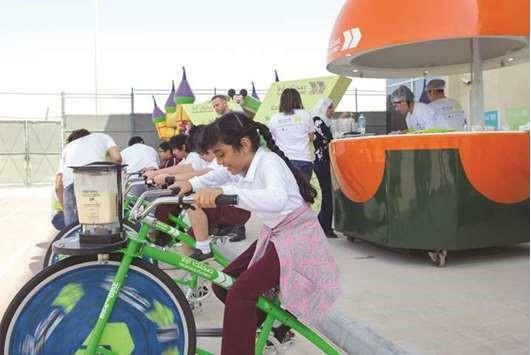 A wide range of free events will also promote healthy living and showcase the services offered by Qatar's leading healthcare providers, including Hamad Medical Corporation, Primary Health Care Corporation (PHCC) and Al-Ahli Hospital. During Doha Healthcare Week, members of the public who answered a call to register last month will have the opportunity to visit the Flying Eye Hospital. The aircraft will be based at the old airport in Doha for the duration of Doha Healthcare Week. Additional highlights include an exhibition at the QF Recreation Centre and QF Headquarters showcasing the work of internationally-renowned photographers, focusing on the health effects of war; a special free screening by Doha Film Institute of ‘Life: Animated' in MIA Park on November 7; a Diabetes Walkathon at Education City, organised by QF member Qatar Diabetes Association on November 9 at 2pm; football on the beach at Katara each evening with ‘Sahtak Awalan Your Health First,' an initiative of QF partner university Weill Cornell Medicine-Qatar ; and healthy cooking classes for families at The St Regis Doha on November 10. Nick Bradshaw, partnerships manager, WISH, said, 'We are excited to be working with a broad range of partners to create Doha Healthcare Week. The initiative aims to raise awareness of the health resources available in Qatar, and to engage the local community in a wide variety of fun and healthy activities during the week leading up to our global healthcare summit, WISH 2018. Doha Healthcare Week runs from November 6-12, leading to WISH 2018, which takes place from November 13-14.